​It’s that time of the year again when people tuck into mooncakes and other delicacies and revel in a tradition stretching back 2,500 years. Mid-Autumn is probably best known for the tradition of eating mooncakes – the Cantonese pastry with an eggy surprise inside. A mooncake’s round shape is supposed to symbolize completeness, which is why they are considered a good accompaniment for family reunions. They are said to have been created by Ming revolutionaries during the Yuan dynasty (1271-1368), who supposedly hid messages inside them as part of their successful attempt to overthrow the Mongolians. Traditionally, a senior family member would cut the mooncake and hand it out to family members. ​To the Chinese, Mid-Autumn Festival means family reunion and peace. The festival is celebrated when the moon is believed to be the biggest and fullest. A full moon is a symbol of prosperity, happiness, and family reunion. For the youngest readers, Grace Lin’s Thanking the Moon offers the best introduction to the Mid-Autumn Festival. Using her trademark economy of words and whimsical illustrations, Lin manages to convey the holiday’s essence, as celebrated by a modern Chinese American family. Mooncakes by Loretta Seto returns to contemporary times while following a mother and father who explain the Mid-Autumn Festival’s ancient folklore to their daughter. It’s like Thanking the Moon for slightly older children who can understand the full scope of the holiday. This might be your family! Ching Yeung Russell’s Moon Festival traces the holiday’s customs back to the small villages in rural China. 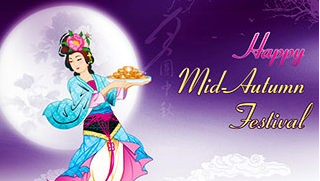 A group of children smells mooncakes baking in the village’s stores, spot a painting of the mythical beauty, Chang’e and then celebrate with roast pork, fruits and sweets under the silver moonlight. Lin Yi’s Lantern by Brenda Williams is a great story for older toddlers, say 3+. The story is about Lin Yi, a boy in a small Chinese town who is sent to the market for Mid-Autumn Festival foods by his mother. Though he bargains hard to have enough money left to buy a red rabbit lantern, his best laid plans run off the tracks and he learns a valuable lesson in the process.